I am not sure if I'm supposed to be able to rotate portals so that is why I haven't submitted a bug report. My question is this: Are rotated 'line set portals' (action 156) supported? I checked the wiki but I could not find my answer. 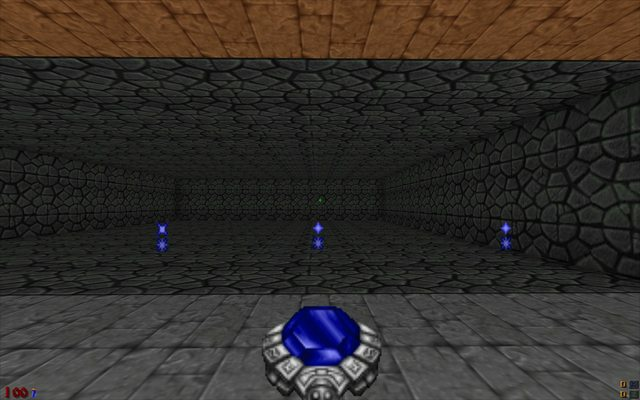 The portal seems to be work fine in my test wad until you shoot a sapphire wand projectile where, upon exiting the portal, the projectile continues travelling in its original direction for a while before the changing to the correct direction. Just in case I wasn't clear, here is a video that shows the problem I encountered. Does anyone have any ideas on what I should do? Weird, it's definintely something to do with the relative orientations of the portal lines. If I rotate one of the rooms by 90 degrees, the weirdness goes away. However, another weirdness appeared. When starfing back and forth firing the wand, some (but not all) of the projectiles got stuck on the portal. Some fell to the ground and vanished, others just hung where they were! Thanks for your investigation enjay. I find this all very bizarre. I wonder if I should submit a bug report. No harm in it. It least then it will have been checked and, if it's a bug, it will get addressed.